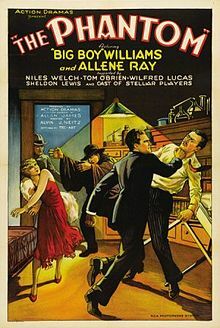 The acting in this film is pretty bad, but I still think it’s a fun flick for a “Stuck In A House With A Killer” flick. What it doesn’t have in the way of good actors it easily makes up for in the thrills it provides. 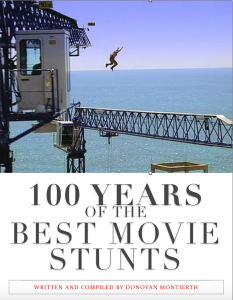 Right from the start, it sets itself apart by one of the slickest craziest stunts I’ve ever seen, especially when you know that this was done in 1931! It starts off in a penitentiary, where a warden is getting ready to execute a killer known as The Phantom. As they prepare the electric chair, the Phantom scales a 20-foot wall, and jumps on a nearby moving train. 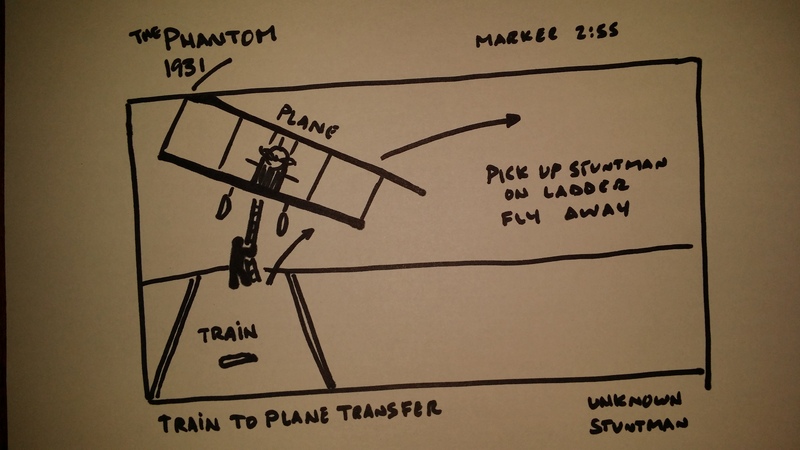 If that’s not enough, wow, the Phantom then jumps on a rope ladder hanging underneath a plane and then flies away. The only problem is, (ironically, befitting the title of the film itself) I have no idea who performed the stunt and who the stunt pilot was. I’ve looked under all the rocks I know of and it appears the knowledge of who these stunt performers are, are lost in time. Look for the stunt to occur starting around 1:55 on the counter. The Phantom was directed by Alan James (Alvin J. Neitz) for Supreme Pictures. 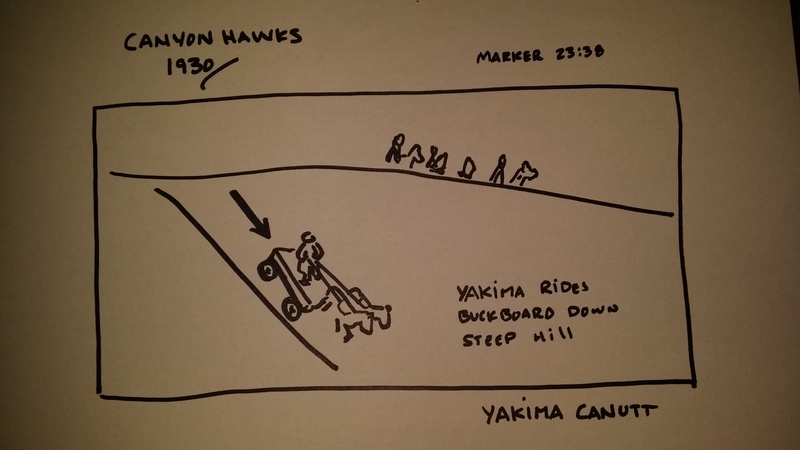 Alan James, as you’ll notice, was the director of Canyon Hawks, the nod of the Best Movie Stunt for 1930, so you know he believes in good stunts! Supreme Pictures: A.W. Hackel (December 18, 1882 – October 22, 1959) was an American film producer who founded Supreme Pictures in 1934. Hackel contracted Bob Steele for 32 of his Westerns, for example Alias John Law in 1935. In 1936, Republic Pictures needed more Westerns and made a deal with Hackel who released his films through Republic. After the demise of Supreme Pictures in 1942, Hackel released through Monogram Pictures. All of his pictures were Westerns with the exception of Am I Guilty? (1940), a race film, and The Flaming Urge (1953), a crime film. There’s a scene in this one where Yak drives an open wagon driven by two horses straight down a precipitous hill that just blows the mind! 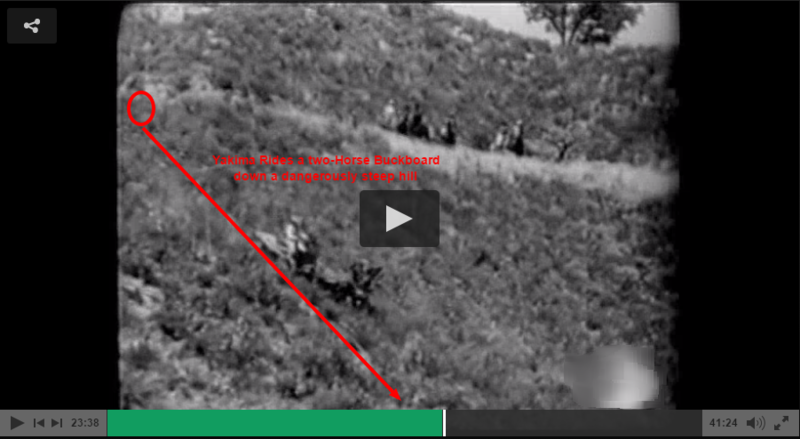 The scene is shot with a group of men on horses watching from the top, obviously afraid of riding their own single horses down the hill – let alone a wagon with two horses attached – and Yak sitting in the seat in the middle at the front! Also, just watching Yak handle his six-shooters is like watching a Wild West Show. 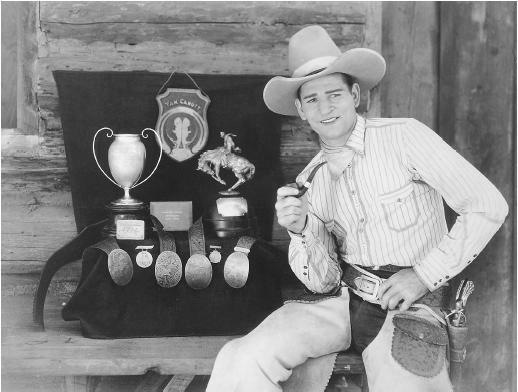 When rodeo riders invaded Hollywood, they brought a battery of rodeo techniques that Canutt would expand and improve, including horse falls and wagon wrecks, along with the harnesses and cable rigs to make the stunts foolproof and safe. Among the new safety devices was the ‘L’ stirrup, which allowed a man to fall off a horse without getting hung in the stirrup. Canutt also developed cabling and equipment to cause spectacular wagon crashes, while releasing the team, all on the same spot every time. 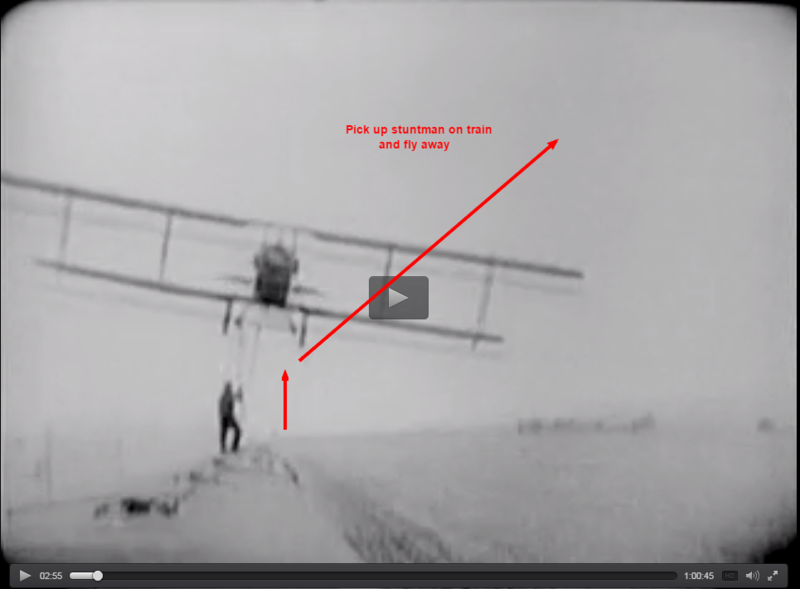 Safety methods such as these saved film-makers time and money and prevented accidents and injury to performers. 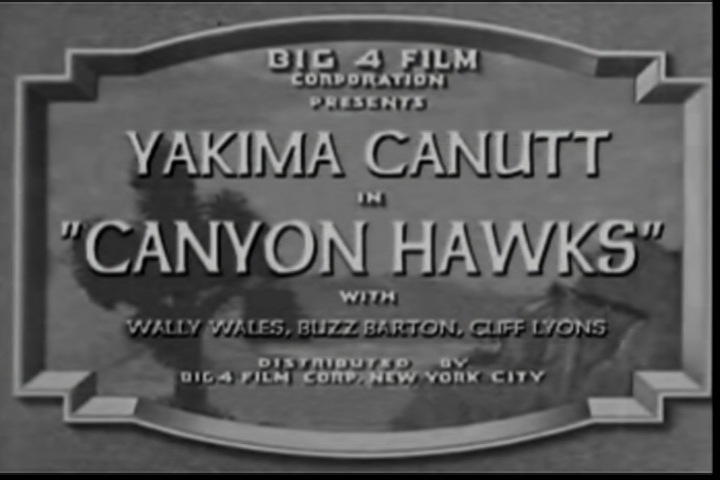 Canyon Hawks (1930) was directed by Alan James (as Alvin J. Neitz) and J.P. McGowan for National Players.